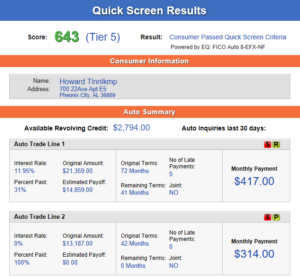 Eliminate the guesswork when working a deal – with QuickScreen from 700Credit! What if you knew your customer’s FICO score and auto credit profile as soon as they walked into your dealership – or drive in for service? What if you had a solution to prioritize inbound leads before you pick up the phone? QuickScreen is integrated with your CRM, so it is easy to access, easy to use. QuickScreen gives you visibility into your customer’s credit profile before you work a deal, so you can work the right deal, right away, saving time and preventing a potentially uncomfortable situation for your customer. In addition to the credit data that is provided in a QuickScreen, our new OpportunityAlerts are graphic icons that alert the dealer to potential opportunities based on the color of the alert: Green/Yellow/Red. A proprietary algorithm reads data from the QuickScreen results and presents the appropriate alert/color. Please download our new OpportunityAlerts sales sheet on the right for more information.